The news this morning is all about the storm wreaking havoc on the East Coast. It was good to get a text from my parents in New Jersey this morning letting us know they’re doing well, but I know others are in still in the thick of it. Our thoughts and prayers are with those who are suffering. Some of us around Chicago this morning are turning our attention to a different crisis, one that has received far less attention. In the days after the upcoming presidential election there will be significant cuts made to the federal budget. 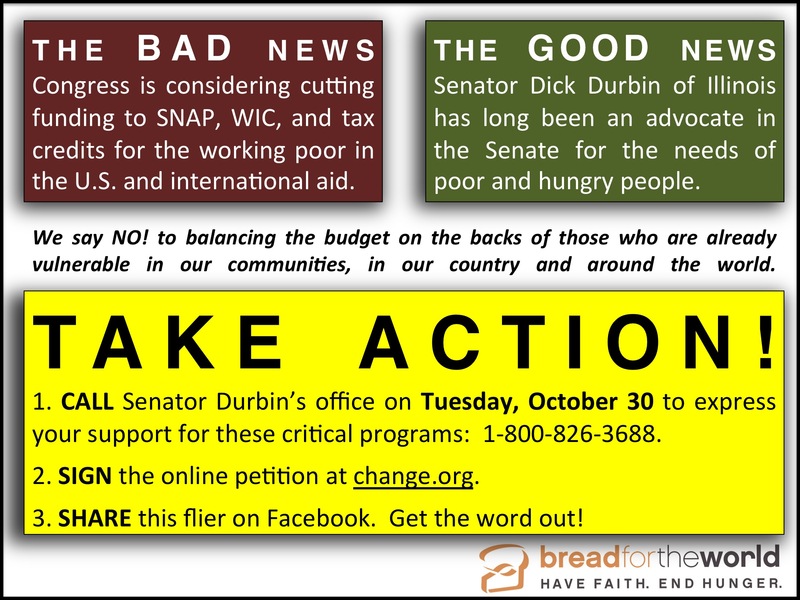 There are some in congress who are looking to cut funding to programs that aid poor and hungry people at home and abroad. This is not a theoretical issue for our church. Some of us have benefitted from SNAP, WIC, and tax credits for the working poor in the past. Others have relied on these programs during the recession. Our church is a part of a neighborhood that straddles two congressional districts which rank first and third in the state when it comes to food insecurity. Cuts to these programs would have a devastating impact on many of our neighbors. Proverbs 31:8-9 says, “Speak up for those who cannot speak for themselves, for the rights of all who are destitute. Speak up and judge fairly; defend the rights of the poor and needy.” I tend to focus on big events like the upcoming presidential election when I think about participating in the political process. But taking a few minutes to make sure our vulnerable neighbors are not overlooked in Washington DC may be just as important as who we vote for next week.